Purchased this bolt handle in 2015. Went on easily. Works way better than stock bolt handle. On my rifle it gave more scope clearance too. Worked well on my mule deer hunt as well. Bolt was delivered in a timely manor and over all the bolt is very well made. Plus the customer service is great they even sent me an instructional video of how to install my new bolt handle. Advantages: Bolt handle is bigger and has better grip making racking a round, much smoother and easier. Disadvantages: bolt handle is heavy, in my case I wanted a heavier bolt handle but it isn't ideal if you are trying to keep your weapon as light as possible. Simply one of the Best Bolt handles out there. This purchase was my 5th one that I've gotten for Savage builds. - Provides extra leverage, looks very sharp & is very functional - Great improvement over the factory supplied bolt handle. Advantages: Extra leverage, Great Looks, Grips well in the hand. Perfect size and weight for smooth operation and clearing of the odd ornery cartridge. Big improvement over stock. VERY easy installation and looks great. Advantages: Perfect length and weight. Looks great and installed easy on my 11VT in a Choate Tactical Stock. No mods required. Huge difference over factory handle. No more smacking fingers on scope! Advantages: Ease of operating bolt. Looks cool too! Outstanding. Handle fit perfect, was very easy to install, took less then 10 minutes. Very well made and finish is well done. Fantastic upgrade to my Savage BA 10 Stealth 6.5. That slightly longer and heavier feel, made for smoother and confident bolt action. Disadvantages: If you have a foam insert in your rifle case, you may need to adjust to accommodate the extra length of the new bolt handle. Looks good fit perfect, very east to install. Advantages: Better clearance of a 4x12 power scope. 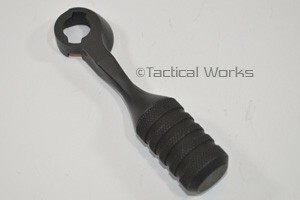 Well made Tactical bolt handle. Order was shipped the same day, you don't get that from the big names. Thank you. Advantages: Added leverage, combined with the bolt lift kit from Nathanial Lambeth, substantially reduced the effort to lift the bolt on my Savage 12FV. Awesome upgrade to the factory bolt. Well built and was shipped fast to boot. Love it. Beefy, nice clean finish. Running it on my Steath 6.5 trying out PRS. Advantages: Easy to find and grip in all conditions. Easy install. I would recommend to anyone looking. The Savage Tactical Bolt Handle BA-Style RH is absolutely what my Savage 110 BA 338 Lapua needed. I replaced the rounded (factory) bolt handle and now have very acceptable action with the Savage 110 BA bolt carrier group. Advantages: Allows an easier extraction and chambering of the ammo/round. The factory bolt I believe is lighter; however, this results in wrestling with the gun to extract and chamber/rechamber the battery. product was as described and it arrived on time. it is a great product. Excellent upgrade to my .308 Rifle from the factory bolt handle. The bolt handle was easy to swap out and made for ease of use at the range. The bolt handle feels durable, is not much heavier than the OEM version, and provides a much more efficient chambering experience. I found no interference with my optics either. If you're looking for something that feels much better when chambering, this is the piece you need. This is a great asset. Makes those long shifts when you are behind the gun for hours at a time more comfortable. Copyright © 2000 -2019 Tactical Works, Inc.